Climate change is turning up the heat on your money. Is your portfolio ready? As the impacts of climate change are felt around the world, a growing number of investors are adding greener investments to their portfolios, not only to make a positive difference but to take advantage of emerging opportunities and to avoid potential losses down the road. So what do you need to know to get your portfolio ready? What are the risks associated with climate change and how are they showing up in your portfolio today? What are the financial opportunities and how can you take part? How can you integrate climate change into your current investment strategy? What climate-ready investment products are available to everyday investors? 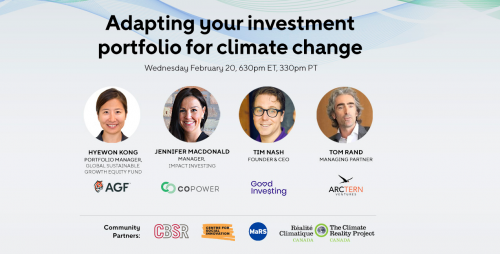 CoPower is teaming up with experts from AGF, Good Investing and Arctern Ventures to bring you a free event and webinar to help you adapt your portfolio for a changing climate. Register to join them in-person at CoPower's Toronto office or attend virtually through their live-streamed webinar.